For many people the loss of their mother is harder than the loss of their father. Not because they loved them any less, but the bond between mother and child is a special one. Your mother gave birth to you. She fed you and nurtured you throughout your childhood. The mother is one who tends to have the most responsibility for the care of the child, and is at home with the children more often than the father in most cases. Your mother is the one you turn to when you break up with your first boyfriend or girlfriend, when you need advice or when you have a problem. Your mother is not only your greatest advocate, she is part of you. You might even look like her. She might be your best friend as well as your mother. It is like losing a part of yourself. 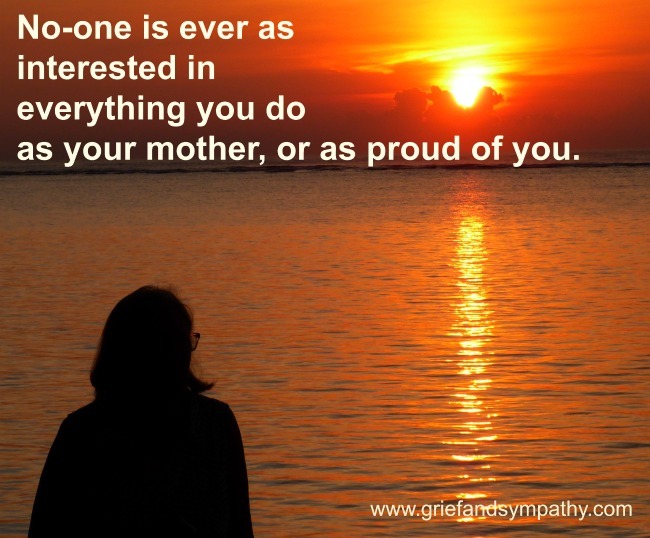 No-one is ever as interested in everything you do as your mother, or as proud of you. Mothers tend to hold families together. They are the ones who keep in touch with all the family members and spread the news around. They are the ones who arrange get togethers, keep the family home together, and generally are the hub of family life. Once the mother is gone, the family either fragments or you have to step in to her role as the main communicator and organiser. Even if you didn't have the perfect relationship with your mother, her loss can be just as devastating. You no longer have the chance to put things right, to hear her say I love you, or I'm proud of you. Although the loss of a parent is a normal part of growing up, and it happens to everyone, it is no less devastating. But many people are surprised at how much it affects them. Their friends and family perhaps won't realise just how big a blow it can be, especially if they were old or ill for a long time and it was expected. Grief for the death of a mother is one of the hardest things we face in life, but nearly all of us have to face it at some time. Everyone's grief is different, and we all have our own ways of coping. We may feel some or all of the emotions of grief at times, or we might just feel numb and blank. When I lost my own mother I went into denial. It was easy to bury what had happened because I was living far away and had two young children to cope with. Have a read of my story about how I failed to grieve properly here. If you are lucky enough to have a close family member or friend in whom you can confide, you may be able to grieve without needing any extra help. Some people, for various reasons, may need some more professional guidance if they get stuck in their grief or don't have any close support network. Men and women grieve differently, so be aware of this. Don't be too hard on your partner if he or she is not able to give you all the support you need. It is a difficult time for them too, and not everyone knows what to do, or what to say. Read my article on Men and Grief for more understanding. However you are feeling, know that you are not alone. Talk to friends and family. Join a grief support group, but don't be ashamed that you are grieving. It is a natural and normal process, even if it happens to everyone at some point in their lives. There are lots more helpful articles on the site to guide you on your pathway through grief.